Anyone who gets so progressive in his thinking that he walks out on the teaching of Christ, walks out on God. But whoever stays with the teaching, stays faithful to both the Father and the Son. Dearly loved friends, I had been planning to write you some thoughts about the salvation God has given us, but now I find I must write of something else instead, urging you to stoutly defend the truth that God gave once for all to his people to keep without change through the years. I say this because some godless teachers have wormed their way in among you, saying that after we become Christians we can do just as we like without fear of God’s punishment. The fate of such people was written long ago, for they have turned against our only Master and Lord, Jesus Christ. We are currently in a series on the gospel of grace. In this five part series I am endeavoring to examine all the emergent voices in the "grace movement" or "grace camp". Before you object I know grace is not a movement or camp. Grace IS the gospel of Jesus Christ. While we know grace is the gospel it is still imperative to take a close look at the different voices arising in the proclamation of grace. Is every voice in the wind something we should be following? Again I must reiterate that examining an idea or philosophy does not equal bitterness. It does not mean it is unloving or legalistic. Paul himself is a great example of this. He is the Apostle of grace. He is also the Apostle of love. God through the Apostle Paul brought forth the major doctrines in the life of the believer. The truths of love, faith, righteousness and grace and peace all can be traced to the Pauline revelation. Now how did Paul deal with error? Paul confronted Peter because he did not want the gospel to be polluted with legalism or traditions of men. This is the same motive I have in writing. I desire to see a pure gospel. A pure grace gospel presented to the World. So lets examine some of these "additives" to the pure gospel. Ultimate reconciliation, is this part of the gospel of grace? Is this idea Biblical? Is God so loving He would never send anyone to hell? Let the Word be final authority. If you note these Scriptures are clear. Those who are unbelieving or rather reject the grace of God choose this option. An eternity apart from God who loves them. Nowhere do the Scriptures teach a "restorative" justice. Folks who reject the grace will not have their "sentence" commuted. God is merciful and gracious and long suffering. God is all these things but He is also just. When we proclaim the message of grace we must agree with God. We must not pollute the stream with false teaching. This is doctrine is a lie and will harm those who hear it. Now what about Inclusionism? Is this Biblical grace? We have just addressed future Inclusionism. It is unBiblical to accept this view as truth. So what about historic Inclusionism? This idea that all mankind was included in the death and resurrection of Jesus. That all are already born again and righteous before God and possess the new nature within but just don't know it. Is the gospel message a "revelation" of who you already are? We will continue in the next blog examining historic Inclusionism or Trinitaran Inclusionism. I pray that this message today has helped you in your walk with the Lord. I pray you consider what has been stated today and see if what you believe is Bible truth or man made ideology. Feel free to leave feedback. Consider sharing if this has stirred you within. Blessings on you as you consider these truths. Spot On and Amen to this. I believe that this is a movement in Christianity that we need to start being vocal about - just keeping it real and telling the truth about what God's word says. I really liked this message and thanks for sharing. Thanks so much for your kind words. We need to let the Word of God be the final authority. Too many believe it's unloving to proclaim the truth. We need to contend for the pure gospel of grace. 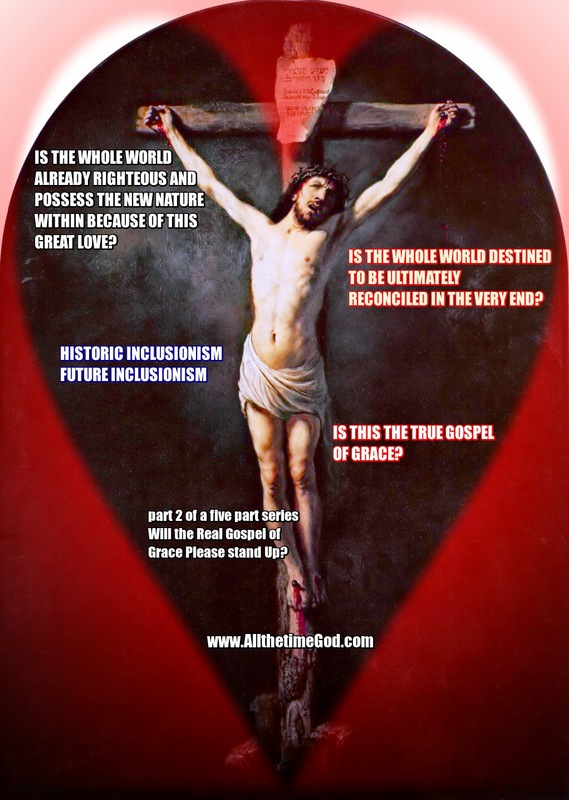 We don't need to accept a fancy unbiblical substitute like inclusion or universalism. Bless you. Please share with friends. The son in whom He is well pleased. Will The Real Gospel of GRACE Please Stand Up?